Russia conferred its highest civilian award on PM Narendra Modi. In a statement announcing the award, the Russian government said, “Narendra Modi was decorated with the Order of St Andrew the Apostle — the highest state decoration of Russia — for exceptional services in promoting special and privileged strategic partnership between the Russian Federation and the Republic of India and friendly relations between the Russian and Indian peoples. 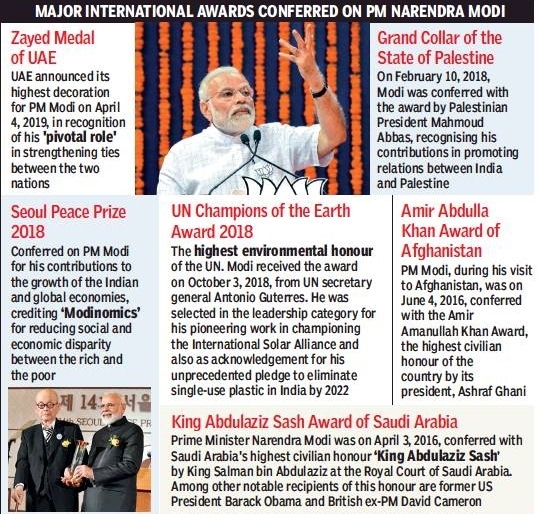 The recognition is the seventh international award conferred on PM Modi in the past few years.